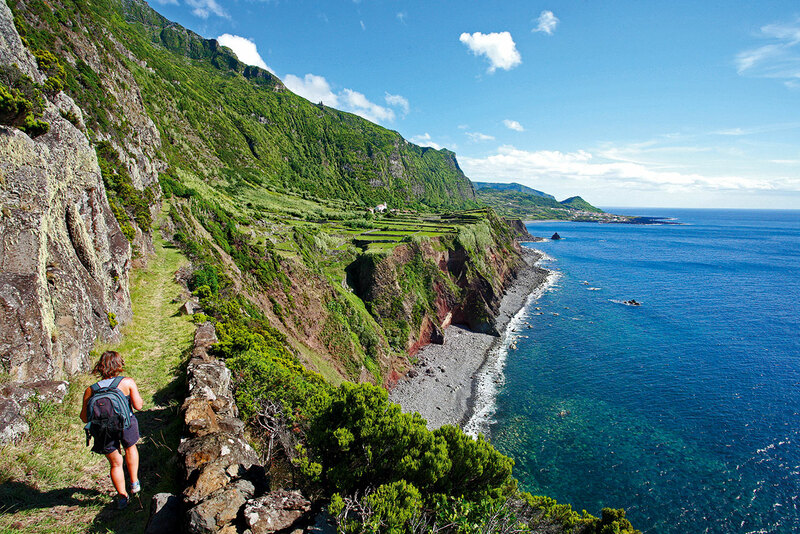 This trail starts at the Fajã de Lopo Vaz Viewpoint and continues along a single route. 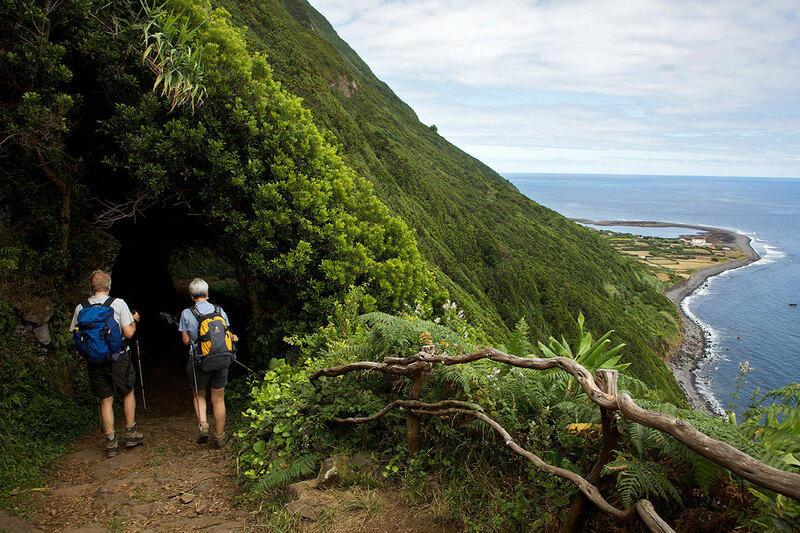 Start by going down a stone stairway which is flanked by endemic vegetation such as Azores heathers (Erica azorica), fire trees (Morella faya) and white wood (Picconia azorica).After 1.25km, near the first house, you will see a black sand beach on the left. This route begins near the viewpoint over the Negra and Comprida lakes. Start by following the path that skirts Comprida Lake on the right. This area is by endemic flora, especially Azores buckthorns (Frangula azorica), Azores junipers (Juniperus brevifolia) and peat moss (Sphagnum sp.). Upon reaching the road, you will see the Seca Lake. This trail begins near the church of Lajedo. Follow the trail signs until the viewpoint over Ponta Negra and the Cartário Islet. Go down the cobbled path flanked by endemic species, including Azores heathers (Erica azorica), Azores junipers (Juniperus brevifolia) and fire trees (Morella faya). Along this path, you will cross several watercourses. This route begins in the vicinity of the quay of Fajã Grande in the western part of the island. Start by taking the asphalt road towards Ponta da Fajã. Once through this village, entre the path along the cliff until you find a sign telling you to turn right. A little further ahead, the shortcut crosses an area rich in endemic species, especially large Azores junipers (Juniperus brevifolia). You will then take a steep climb to Rocha do Risco, wheresome areas can be quite dangerous; therefore, you should take extra care. The island of Flores is 16.6 km long and has 12.2 km at its maximum width, which translates into a surface of 141.4 sq. km. 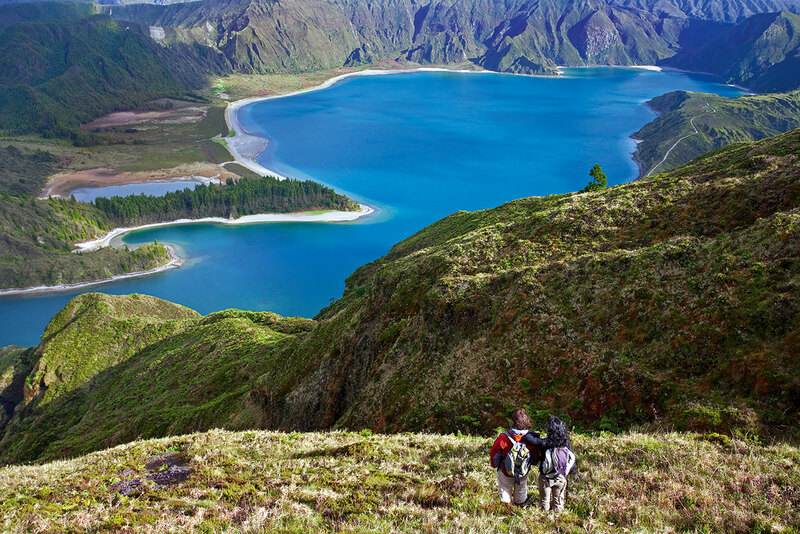 Together with the island of Corvo, which is 17.9 km away, it forms the Western Group of the Azores Archipelago. The European Continent has its westernmost point on this piece of land where 3 793 people live (2011 data). At an altitude of 911 metres, the Morro Alto is the island’s highest point and is located at 39°27’48’’ latitude north and 31°13’13’’ west.